Queen of the World Church: Welcome! We welcome you to the Queen of the World Parish Web Site. Queen of the World Parish is the youngest of the three Catholic Churches in St. Marys, PA. It was founded in 1955 by the Diocese of Erie and staffed by the Benedictine Fathers of St. Vincent Archabbey to meet the needs of the growing Catholic population in St. Marys. Since August of 2006 Queen of the World has been staffed by both the priests of the Diocese of Erie and the Benedictines of St. Vincent. A vibrant parish community of 1,150 families, Queen of the World Parish strives to strengthen and deepen the faith of all its parishioners by Word and Sacrament. Our Sunday masses are the center of our life as a parish family. It is from our Sunday Eucharistic Celebrations that our parish life flows and is strengthened. 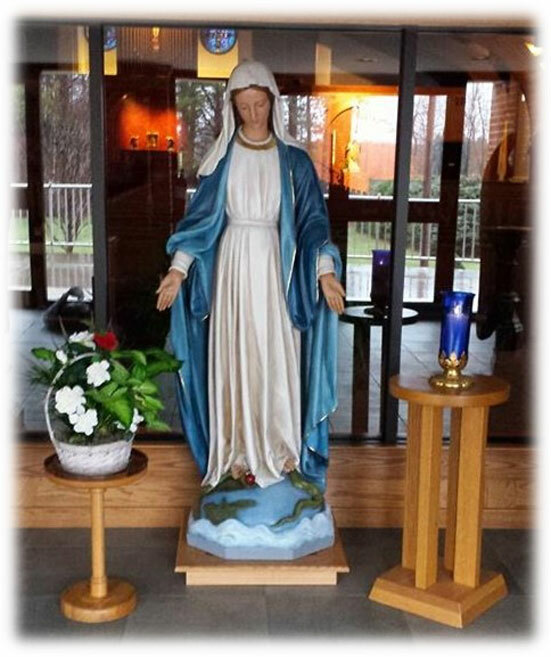 I would invite you to visit this web site often to see the many good things that are happening at Queen of the World Parish. Every Thursday. All day beginning after 7:00 am Mass and ending with Evening Prayer and Benediction at 6:30 pm. Adoration will following the 7am Mass and continue until 6:30pm with Evening Prayer and Benediction.